Nissan said Friday it will launch its Leaf electric vehicle in Japan on Dec. 20, in its first major step toward its goal of becoming a leader in the electric car market. Nissan, Japan's second biggest car maker by volume, has been slow to enter the increasingly important market for fuel-efficient cars, lagging behind rivals such as Toyota Motor Corp., which has dominated the market with its hybrid gasoline-electric technology. Nissan rolled out its first mass-market hybrid powered by its own technology, the Fuga, only last month. But with the launch of the Leaf, Nissan joins Mitsubishi and Fuji Heavy Industries, the maker of Subaru-brand cars, as one of the few Japanese automakers to offer a fully electric car for the mass market, jumping ahead of major rivals like Toyota and Honda Motor Corp.
"The time has finally come," Toshiyuki Shiga, Nissan Chief Operating Officer, said at a press conference. Nissan has set the price for the Leaf at Y3.76 million, and customers in Japan can currently receive a government purchasing subsidy of up to Y780,000 per vehicle. The Leaf, which runs 200 kilometers on a single charge, can be charged with equipment installed at each of Nissan's 2,200 dealers in Japan. The Leaf will also debut in the U.S. this month, and in Europe early next year. The company said the new electric hatchback will hit showrooms in other global markets in 2012. 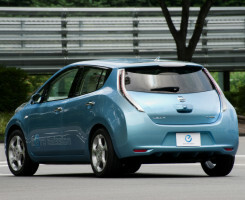 Shiga said the company received 6,000 advance orders for the Leaf just two months after it started taking them in April, and has received 20,000 orders in the U.S. Nissan is also taking orders in Europe, though it declined to say how many it has received so far. If Nissan can keep up that kind of momentum, the Leaf is likely to become one of biggest sellers in its class--at least for a while. Mitsubishi Motors plans to produce 9,000 units of its i-MiEV electric car--for both domestic and overseas markets--in the current fiscal year through March 2011, with 18,000 units planned for the following year and 40,000 for the year ending March 2013. Fuji Heavy, meanwhile, plans to sell only 400 units of its Stella electric mini car in the two years through March 2011. But competition in the sector is set to intensify over the next few years as General Motors Co. begins selling its Chevrolet Volt this month, while Toyota will launch electric vehicles in Japan, the U.S. and Europe in 2012. Honda Motor Co. is also set to launch battery-powered models in the U.S. and Japan in 2012. However, the relatively short driving ranges of electric cars and the scarcity of charging stations will likely prevent them from taking a big slice of the mass market anytime soon. Nissan itself thinks electric cars will account for 10% of global vehicle sales by 2020, but an estimate by JP Morgan puts that figure closer to around 1% or 2%. Nissan's COO said that about 80% of drivers in Japan have an average daily range of 50 kilometers or less. The Leaf, therefore, should be able to cover most drivers' needs in terms of range, he said. But with production costs for electric models remaining high, Nissan's Shiga said that the company's electric car business will be profitable once it can cut costs and increase sales volume, though he declined to elaborate. 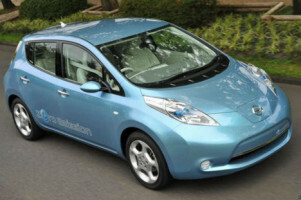 The Leaf is the first of four electric models that Nissan plans to introduce by the end of 2014, with later models to include a luxury-class electric car.